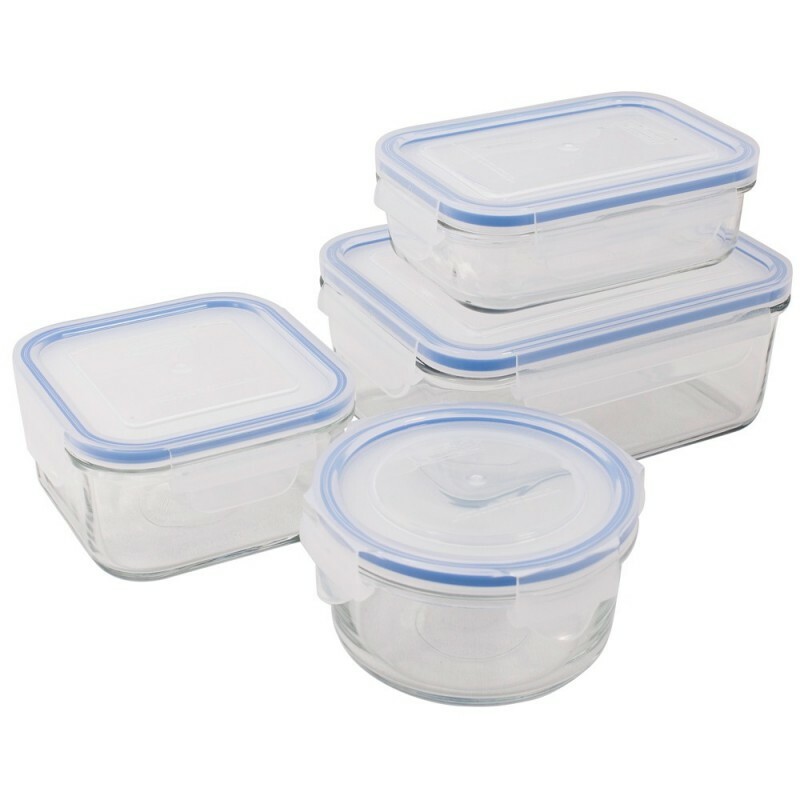 A classic Glasslock glass container set featuring one round, one square and two rectangular containers. Designed for use in the fridge, freezer, microwave and dishwasher this blue seal set will cover all your leftover and lunch needs. Eco friendly and made from tough wearing, Tempermax, a toxin and BPA free glass. 2 x 400ml, 1 x 490ml and 1 x 1.1L containers. Storing, freezing and serving food from glass ensures that your food is not contaminated with unwanted chemicals including BPA, PVC and Phthalates. Glasslock glass is nonporous and impermeable. Glass is infinitely recyclable. Four piece set includes two rectangle containers, one square and one round. Water-tight and air-tight lid with integrated silicone seal, making it leakproof. Easy to open and close snap lock lid - passed the 'use' testing machine over 3 million times! Tempered glass is five times stronger than normal glass - if broken, it shatters into pebble pieces rather than shards, lasts longer and does not become fragile with use. Microwave safe without lid (remove lid before microwave use). Top rack dishwasher safe. Freezer and fridge safe. Not oven safe. Glasslock containers with blue seal are not usable in the oven. Only Glasslock containers with the red seal are suitable for oven use. Do not use Glasslock these containers in a conventional oven, toaster oven, under a griller, on a cooktop, under a flame or any other direct heat source. Avoid severe and sudden temperature changes to avoid the rish of breaking. These reusable tempered glass containers are ideal for storing snacks, yoghurt, dips, nuts, pasta, fruit salad and more. 1 x 400ml rectangle food container. 1 x 400ml round food container. 1 x 490ml square food container.